Welcome to Indiaproperty365.com. Our company recently launched its new project in Veppampattu. Our layout exactly located 4Km from Veppampattu Railway Station. At present we have only 1500 Sq.ft and above plots only available for Sale. Our layout is DTCP Approved Layout. So you can go for a Bank Loan. 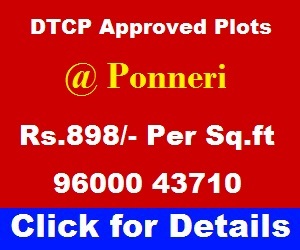 1500 Sq.ft DTCP Approved Plots for Sale in Veppampattu Rs.8,32,500/-. Our plots located in Punnapattu, Near Sirukalathur Village of Thiruvallur District. Rs.555/- Per Sq.ft. Call: 9600043710. Punnapattu is a Village in Tiruvallur Taluk in Tiruvallur District of Tamil Nadu State, India. 37 Kms from State Capital Chennai. Punnapattu Pin code is 602025 and Postal Head Office is Thottikalai. 4 Km from Veppampattu Railway Station. Bus Stop – Two Buses from Koyambedu Bus Terminus Stops here in-front of our layout. Vevekanandha Vidyalaya School, Etc. All the above schools nearer to our Veppampattu site. Bhajarang Engineering College, Veppampattu. One of the best college in North Chennai. Jaya Engineering and Arts & Science College, Etc. Balance amount paid within 15 Days from the day of Advance Registration, Patta, EC, Rs.10,500/- Worth Gift will be absolutely Free ! If remaining amount paid within 3 Months Registration Free! But, Patta will be Charged. If remaining amount paid within 11 Months Customer Should Bear the Registration and Patta Charges. If half of the Total Amount is paid within 15days Registration is done for Free and remaining amount should be paid within 11 Months.